What should I expect when I get to Refresh for my beginner yoga series? Come to your first class with an open mind! Plan to arrive a few minutes early so that you can find a parking space and the studio. Remember we are on the 2nd floor! It’s tempting to stop for ice cream on the way up, but we recommend you treat yourself after class. As with most athletic or exercise related activities, a full stomach is not your friend. When you get there, the front desk staff will greet you and show you where you can put your items. You will take off your shoes and leave them in the lobby before you enter the studio. Inside the class space are cubbies for you to put your valuables. Most people do yoga in bare feet, but others like to have socks with rubber grips. It’s entirely up to you. If you have a yoga mat, please bring it. You can also rent one of our high-quality brands to see how they feel. Doing yoga on a soft, non-slip surface is really important and it can greatly shape your experience. The thickness and length of the mat depends on your individual preference, so much like a new pair of shoes, we recommend you try some out before you buy. You do not need to buy expensive clothes to do yoga. Loose or fitted athletic wear both work equally well. We recommend that your pants aren’t so long that you trip on them, and that they are at least made well enough so that they aren’t transparent when you stretch. You don’t want your shirt to ride up when you bend over, so make sure you either tuck it in or that it stays in place. Bring a bottle of water to help you quench your thirst during class. We have a filtered water tap you can use to refill. If you forget, we have some nifty water bottles available for sale. The first day of your series you will conduct introductions with your teacher and fellow students. Expect to share why you decided to come to the class and what goals you might have for the series. Your teacher will then take you through some warm-up movements to prepare you for learning your first yoga postures. Don’t worry; it will all be gentle and basic. These will be simple things to help you loosen up your back and joints. As you move, your teacher will guide you to monitor your breath and she will assess your current state of flexibility and strength. Once you are warmed-up, the most challenging posture of this evening will be Downward Facing Dog (yes, most poses involve an animal of some sort!). This pose can be a bit difficult at first, but by the end of the series, you will probably grow to like it more and more. 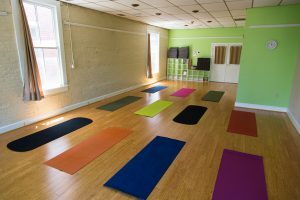 Our goal is that you find your first day of yoga to be both invigorating and relaxing. We hope this addresses any concerns you might have! If not, you can always drop us an email or pay us a visit.